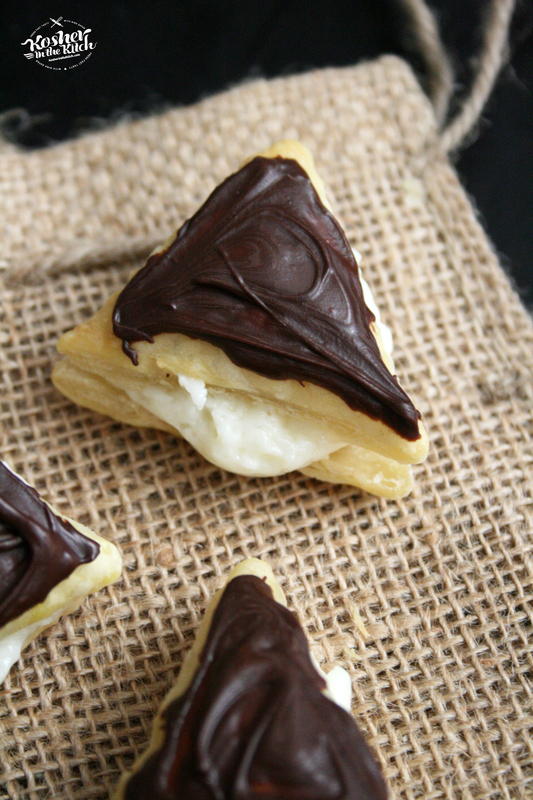 Chocolate Eclair Hamantaschen - Kosher In The Kitch! 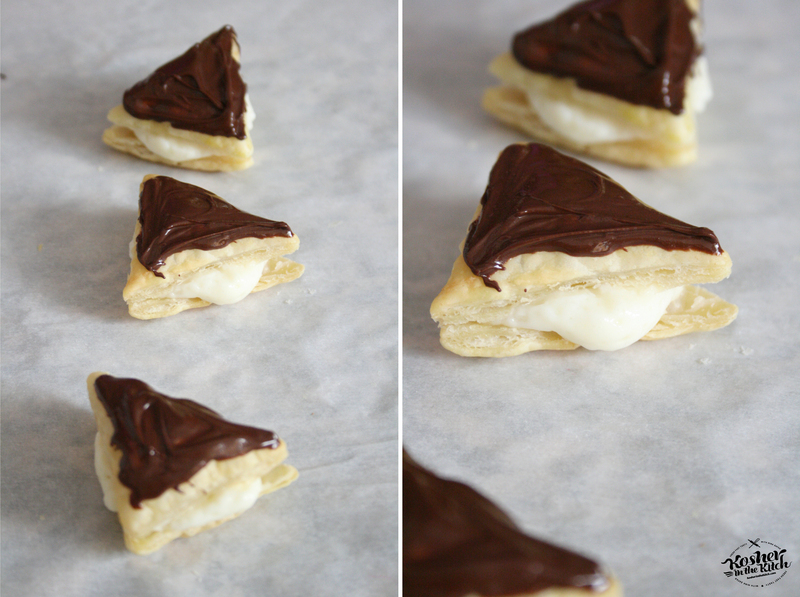 Chocolate Eclair Hamantaschen - Kosher In The Kitch! It’s a new year which means a fresh new batch of fun and festive hamantaschen will be served up on the blog, kosher in the kitch! 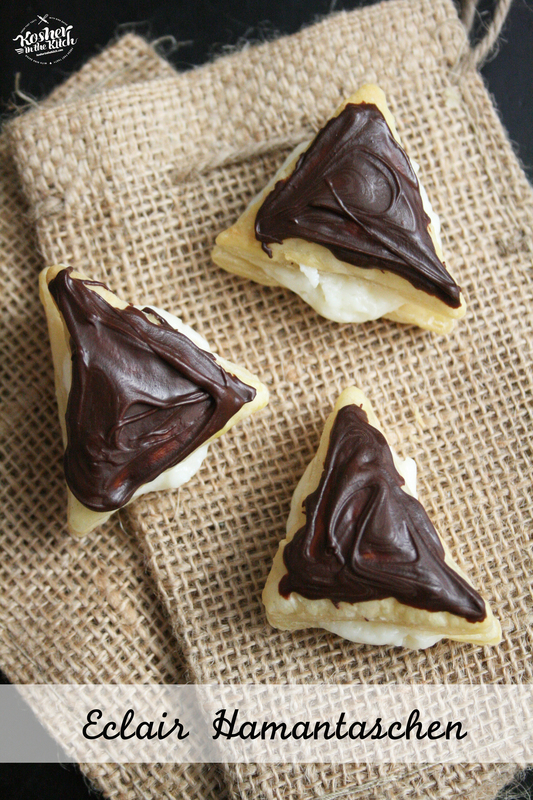 I am kicking off the Hamantaschen countdown with these delicious Chocolate Eclair Hamantaschen. While traditional eclairs use a batter to bake the crispy shell, then a homemade custard filling this recipe uses store bought puff pastry, instant vanilla pudding and chocolate chips making it a super simple treat to whip up for the holiday. 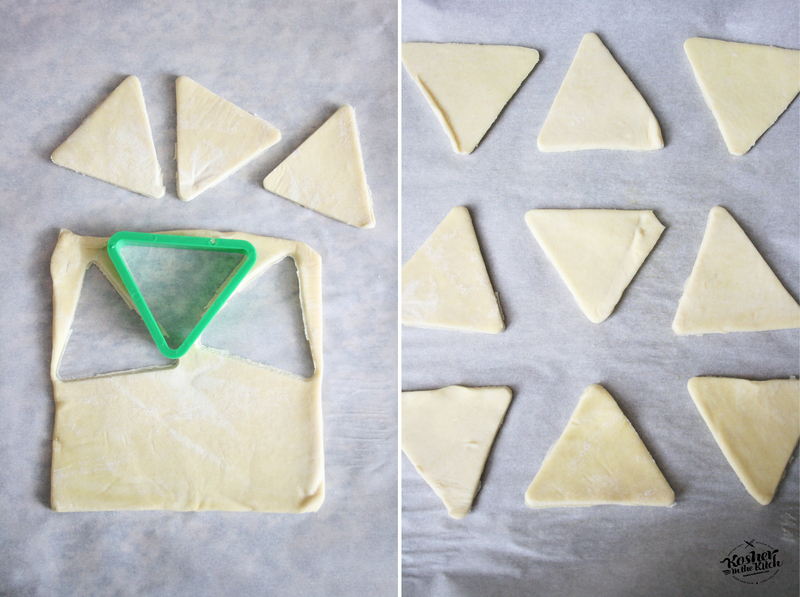 Cut triangle out of puff pastry dough using a cookie cutter. Place on baking sheet lined with parchment paper then bake on 350′ for 10 to 12 minutes until puffed. 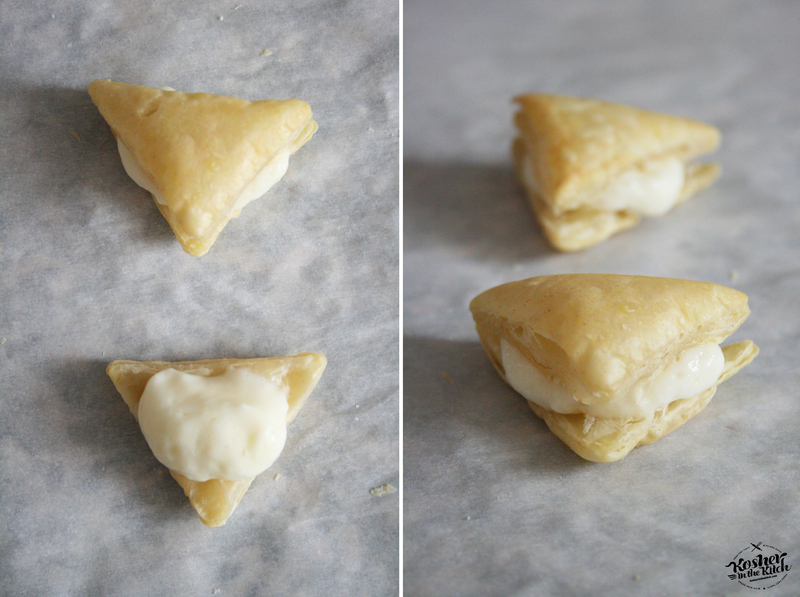 Once puff pastry is baked, allow to cool off then take one puff pastry triangle and gently separate into two layers. Top one layer with vanilla pudding then place the other layer on top of pudding. Melt chocolate chips by placing in microwave safe bowl and melt on 30 second intervals. Top puff pastry triangle with melted chocolate. Love it! Where do I find a triangular cookie cutter? I found some on amazon however I have also used a round cutter for help in sizing then cut out a triangle from that or you can use the photo as a guide to trace out a bunch of hexagons connected then cut them out to create triangles. 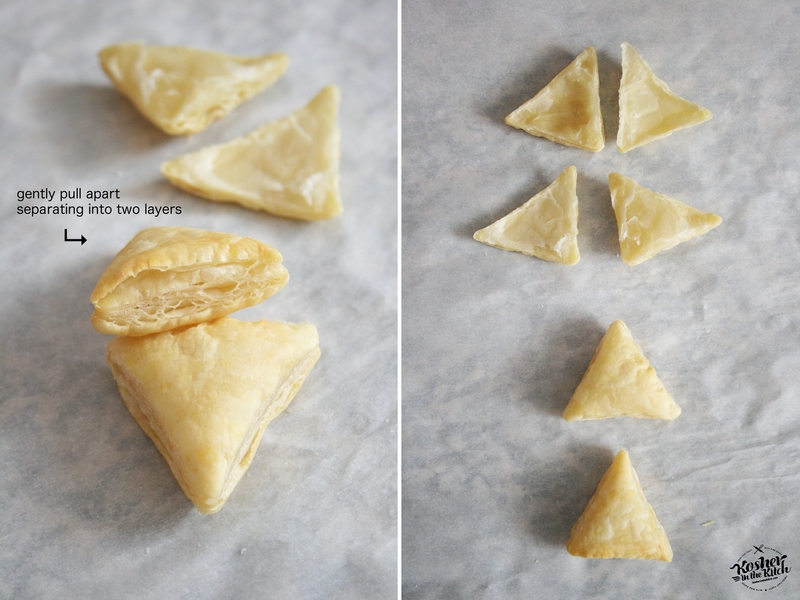 Or, you could just cut the phyllo dough in strips, then cut the strips into squares, then cut diagonally to have triangles. No cutters needed.